Empire, the Italian watchmaking brand, was founded in 1998 in Naples, famous for its ancient historical monuments. The company's founder, Alfred Marciano, thinks that you don't have to use fancy and strange elements of design to take a decent space in the watchmaking industry and conquer the clients' hearts. The company's multiple collections with unique model lineups are represented in a wide price range. The brand's pieces meet the tastes and demands of different social groups' representatives. The watches models are notable for their high technical specifications and classically consistent design. High quality Swiss movements are used in the models' assembly. The cases and the bracelets are made of stainless steel. The cases can be classic round, rectangular or barrel-shaped. Some models' cases have PVD coating to protect them from mechanical damages. The straps are made of natural leather, but variations with rubber or black carbon straps are also available. The dials of different colors are covered with sapphire glasses with antireflective coating. There's the company's logo engraved in the back case of the watches. Empire watch will be an ideal addition to your image and will make it even more sophisticated and unique. The watches' models can become a great present for your friends and relatives. 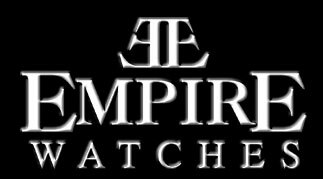 You can buy Empire watches from the company's showrooms in Naples or you can order them at the company's official website.